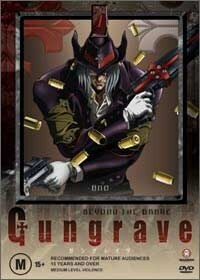 There are no real heroes in Gungrave, but it is a compelling tale nonetheless. There are only two possible innocents in this story, but considering that only the first four episodes are presented here, I'm not ready to place any bets. One of these characters is Brandon's girlfriend Maria, and I have a feeling she'll play a major role in creating the rift between Harry and Brandon. I also suspect that Mika, one of Brandon's companions following his rebirth, is more than she appears to be; it is made clear that she wants to see Harry dead because he gave the order for her mother's execution, but I doubt it's that simple. The plotting here is twisty and gnarled, and I quite enjoyed it. Gungrave seems to draw much of its inspiration from the works of Sergio Leone, with a little bit of Sergio Corbucci's Django (love that coffin!) thrown in for good measure. Much of the storytelling resembles the laconic, operatic nature of Leone's westerns, while the plot of these early episodes brings to mind Once Upon a Time in America. Grave, like many of Leone's antagonists (or protagonists, depending on your point of view), is a man of few words; I think Boba Fett has more dialogue than this guy. The first episode begins in what we can assume is the present, as Grave is reborn and undertakes his mission of revenge; the next three episodes flesh out the back story, as we begin to see how Brandon and Harry started down their particular highway to hell. After sitting through too many anime titles that sacrifice character and incident for the sake of action, it's refreshing to find one that actually gives itself room to breathe. Grave has a long journey ahead of him, and it would become tedious rather quickly if he did nothing but waste a few people every episode. I hope the plotting remains complex, but not to the point that it becomes unwieldy. The technical presentation here is fantastic. This is my first experience viewing a Geneon release, and I hope the quality here is indicative of the company's standards. The anamorphic picture is beautifully detailed; the source elements were undoubtedly immaculate. The color scheme varies between brightly lit interiors and daytime scenes to rainy, pitch-black nights (imagine Ridley Scott and Michael Bay collaborating), often in the space of just a few moments; the transfer handles these transitions with incredible ease. The sound is just as impressive. The English 5.1 Dolby Digital option is well done, and the dubbing is a cut above what I've come to expect. The sweet DTS track is even better (yes, I'm a DTS disciple); bass is deep and tight, and the surrounds kick during the gunfights. You'll hear gunshots ricocheting, shell casings hitting pavement, and rolling thunder. The nearly omnipresent sound of falling rain in the surrounds made me look out the window a couple of times. Even better is hearing the growling stomach of a character experiencing hunger pangs; it was so realistic I jumped up and made myself a sandwich. The Dolby and DTS are identical in the actual information they convey, but the DTS track wins the race. Extras aren't much; all you get are some conceptual designs, previews, and textless credits sequences. In a way I'm a little glad the extras weren't more extensive; too much information might have accidentally provided some plot spoilers.